It started three years ago as a way to get special education students interested in fitness. Now the AP Runners club at American Senior High School in Hialeah has turned into a source of pride for the whole school. NBC 6's Ari Odzer reports. There are 40 kids on the team, and all 40 are either on the autism spectrum or have intellectual deficits. They each have reasons for joining the squad. "I like it a lot," said freshman Amin Darrazi. "Because it's the perfect way for me to lose some weight." "And making my family proud of me," said teammate Christian Rendon, who was standing next to Amin. Joaquin Figueroa, a sophomore who also plays varsity volleyball and swims for his school despite having autism spectrum disorder, said the AP Runners fits into his training. "I run every day and I like to play sports, so it's good for me," Joaquin said. "I'm like the captain, and it's a lot of responsibility to make, like, the team look good, and we train hard," explained Carolina Gutierrez. Coach Perez says being part of this team gives the kids much more than a physical fitness boost. "So their self-esteem goes up, confidence goes up, and their behavior starts to change," Perez said, pointing out that their overall performance in school improves. "We're always on point, on task and we have to be a source of excellence," said co-captain Luis Perez. The AP Runners are training for the upcoming Superintendent's 5K run, so who do you think dropped in to train with them on this day? 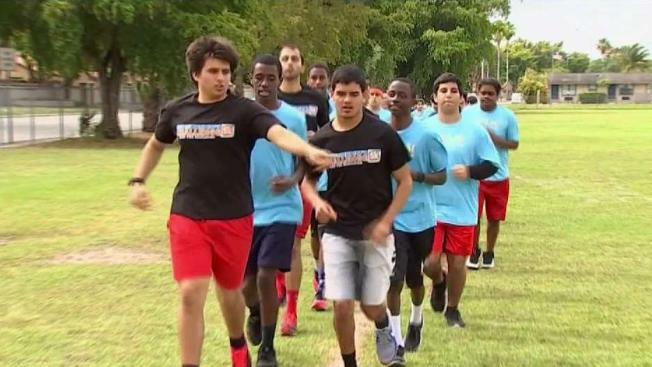 "These kids have skills, these kids have desire to succeed, all that's lacking sometimes is someone who believes in them, Annie Perez believes in them," said Miami-Dade Schools Superintendent Alberto Carvalho, a fitness buff, shortly before leading the kids in warmup exercises. Carvalho ran a mile with the team, but some of the boys decided to show off their abilities at one point and left the superintendent behind. "You know sometimes, as educators we focus so much on the disability that we forget to acknowledge the ability, and today they proved it, if we set expectations they will meet us there and they'll go beyond them, they left me in the dust!" Carvalho said, laughing. Some of the students couldn't run a lap when they joined the team. Coach Perez tells them it's not where they start, it's where they finish, and the AP Runners are finishing strong.